 A tsunami is a series of waves generated when a body of water, such as a lake or ocean is rapidly displaced on a massive scale. Earthquakes, landslides, volcanic eruptions and large meteorite impacts all have the potential to generate a tsunami. The effects of a tsunami can range from unnoticeable to devastating. The word "tsunami" is Japanese for "harbor wave", because tsunamis cause little or no visible effect in deep sea, and often Japanese fishermen would be out at sea fishing in deep sea when a tsunami came, and in the evening they came home and found their home village devastated by the tsunami, and thus they theorized that tsunamis only happen in harbors and elsewhere close inshore. Although in Japanese tsunami is used for both the singular and plural, in English tsunamis is well-established as the plural. The term was created by fishermen although they had not been aware of any wave in the open water. A tsunami is not a sub-surface event in the deep ocean; it simply has a much smaller amplitude (wave heights) offshore, and a very long wavelength (often hundreds of kilometres long), which is why they generally pass unnoticed at sea, forming only a passing "hump" in the ocean. Tsunamis have been historically referred to as tidal waves because as they approach land they take on the characteristics of a violent onrushing tide rather than the sort of cresting waves that are formed by wind action upon the ocean (with which people are more familiar). However, since they are not actually related to tides the term is considered misleading and its usage discouraged by oceanographers. A tsunami can be generated by any disturbance that rapidly moves a large mass of water, such as an earthquake, volcanic eruption, landslide or meteorite impact. However, the most common cause is an undersea earthquake. An earthquake which is too small to create a tsunami by itself may trigger an undersea landslide quite capable of generating a tsunami. Tsunamis can be generated when the sea floor abruptly deforms and vertically displaces the overlying water. Such large vertical movements of the earth's crust can occur at plate boundaries. Subduction earthquakes are particularly effective in generating tsunamis, and occur where denser oceanic plates slip under continental plates in a process known as subduction. Sub-marine landslides (which are sometimes triggered by large earthquakes) as well as collapses of volcanic edifices may also disturb the overlying water column as sediment and rocks slide downslope and are redistributed across the sea floor. Similarly, a violent submarine volcanic eruption can uplift the water column and form a tsunami. In the 1950s it was discovered that larger tsunamis than previously believed possible could be caused by landslides, explosive volcanic action and impact events. These phenomena rapidly displace large volumes of water, as energy from falling debris or expansion is transferred to the water into which the debris falls. 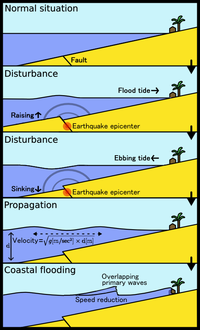 Tsunamis caused by these mechanisms, unlike the ocean-wide tsunamis caused by some earthquakes, generally dissipate quickly and rarely affect coastlines distant from the source due to the small area of sea affected. These events can give rise to much larger local shock waves (solitons), such as the landslide at the head of Lituya Bay which produced a water wave estimated at 50 Ð 150 m and reached 524 m up local mountains. However, an extremely large landslide could generate a megatsunami that might have ocean-wide impacts. Often referred to as "tidal waves", a tsunami does not look like the popular impression of "a normal wave only much bigger". Instead it looks rather like an endlessly onrushing tide which forces its way around and through any obstacle. Most of the damage is caused by the huge mass of water behind the initial wave front, as the height of the sea keeps rising fast and floods powerfully into the coastal area. The sheer weight of water is enough to pulverise objects in its path, often reducing buildings to their foundations and scouring exposed ground to the bedrock. Large objects such as ships and boulders can be carried several miles inland before the tsunami subsides. Tsunamis act very differently from typical surf swells; they are phenomena which move the entire depth of the ocean (often several kilometres deep) rather than just the surface, so they contain immense energy, propagate at high speeds and can travel great trans-oceanic distances with little overall energy loss. A tsunami can cause damage thousands of kilometres from its origin, so there may be several hours between its creation and its impact on a coast, arriving long after the seismic wave generated by the originating event arrives. Although the total or overall loss of energy is small, the total energy is spread over a larger and larger circumference as the wave travels. The energy per linear meter in the wave is proportional to the inverse of the distance from the source. (In other words, it decreases linearly with distance.) This is the two-dimensional equivalent of the inverse square law, which is followed by waves which propagate in three dimensions (in a sphere instead of a circle). A single tsunami event may involve a series of waves of varying heights; the set of waves is called a train. In open water, tsunamis have extremely long periods (the time for the next wave top to pass a point after the previous one), from minutes to hours, and long wavelengths of up to several hundred kilometres. This is very different from typical wind-generated swells on the ocean, which might have a period of about 10 seconds and a wavelength of 150 metres. The actual height of a tsunami wave in open water is often less than one metre. This is often practically unnoticeable to people on ships. The energy of a tsunami passes through the entire water column to the sea bed, unlike surface waves, which typically reach only down to a depth of 10 m or so. The wave travels across open ocean at an average speed of 500 mph. As the wave approaches land, the sea shallows and the wave no longer travels as quickly, so it begins to 'pile-up'; the wave-front becomes steeper and taller, and there is less distance between crests. While a person at the surface of deep water would probably not even notice the tsunami, the wave can increase to a height of sixstories or more as it approaches the coastline and compresses. The steepening process is analogous to the cracking of a tapered whip. As a wave goes down the whip from handle to tip, the same energy is deposited in less and less material, which then moves more violently as it receives this energy. A wave becomes a 'shallow-water wave' when the ratio between the water depth and its wavelength gets very small, and since a tsunami has an extremely large wavelength (hundreds of kilometres), tsunamis act as a shallow-water wave even in deep oceanic water. Shallow-water waves move at a speed that is equal to the square root of the product of the acceleration of gravity (9.8 m/s2) and the water depth. For example, in the Pacific Ocean, where the typical water depth is about 4000 m, a tsunami travels at about 200 m/s (720 km/h or 450 mi/h) with little energy loss, even over long distances. At a water depth of 40 m, the speed would be 20 m/s (about 72 km/h or 45 mi/h), which is much slower than the speed in the open ocean but the wave would still be difficult to outrun. However, a conjecture exists for velocities. The passing "hump" mentioned earlier is a "momentum flux" equal to density multiplied by the square of the velocity. This gives the transient pressure built up during the quake as equal to twice and in addition to the hydrostatic pressure. There is no proof for this. 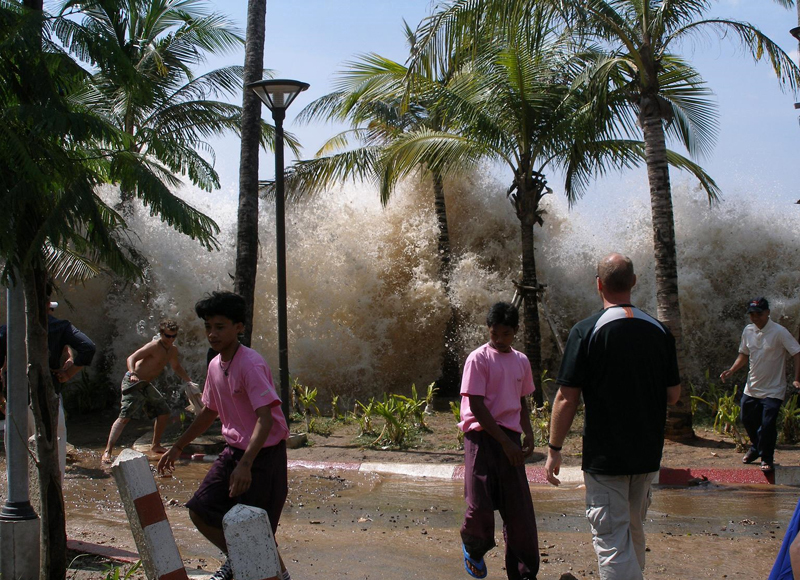 Tsunamis propagate outward from their source, so coasts in the "shadow" of affected land masses are usually fairly safe. However, tsunami waves can diffract around land masses (as shown in this Indian Ocean tsunami animation as the waves reach southern Sri Lanka and India). It's also not necessary that they are symmetrical; tsunami waves may be much stronger in one direction than another, depending on the nature of the source and the surrounding geography.